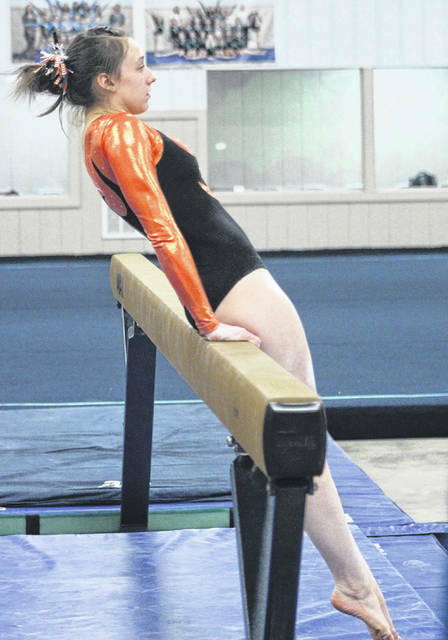 Versailles’ Ellie Barga competes on the Beam at the Versailles Quad meet last Thursday. Greenville’s Emily Marchal competes on the Beam at the Versailles Quad meet last Thursday. 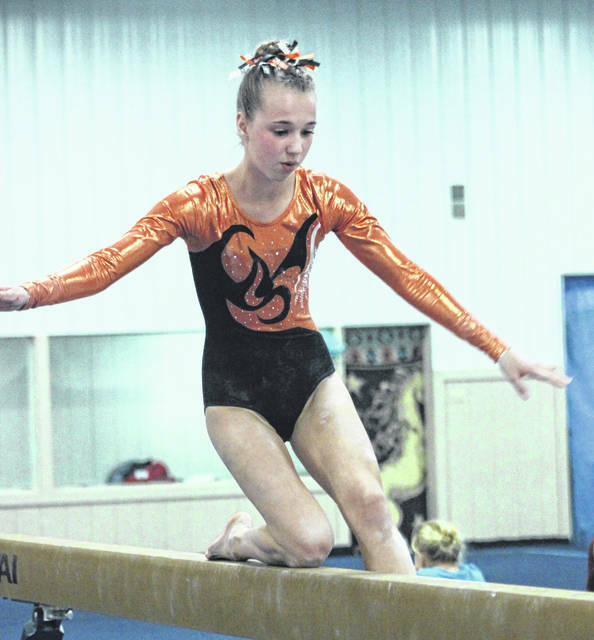 Versailles’ Jadyn Barga competes on the Beam at the Versailles Quad meet last Thursday. Versailles’ Jayla Pothast competes on the Uneven Bars at the Versailles Quad meet last Thursday. 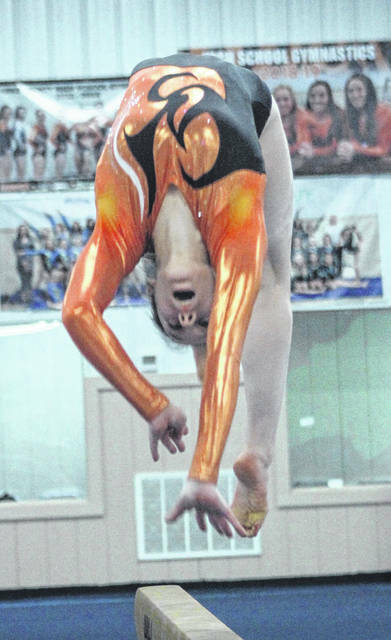 Versailles’ Jayla Pothast competes on the Beam at the Versailles Quad meet last Thursday. Versailles’ Madison Ahrens competes on the Uneven Bars at the Versailles Quad meet last Thursday. 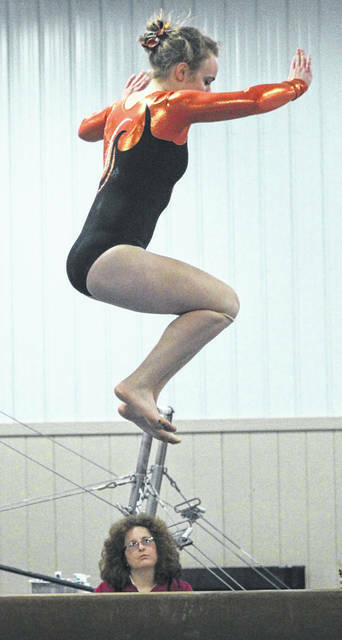 Versailles’ Madison Ahrens competes on the Beam at the Versailles Quad meet last Thursday. 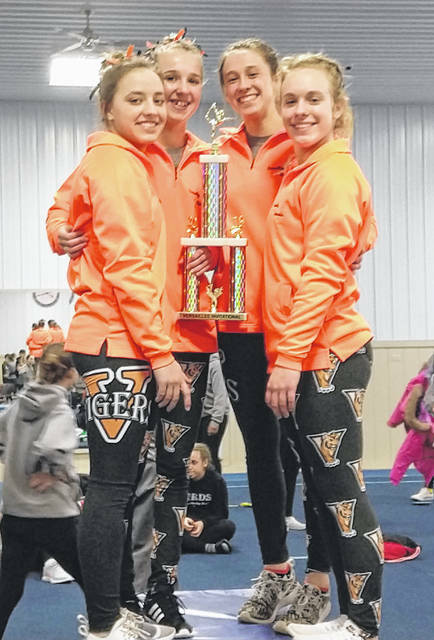 The Versailles gymnastics team won its own home quad meet last Thursday. Pictured left to right are team members Ellie Barga, Jayla Pothast, Jadyn Barga and Madison Ahrens. The Lady Tigers scored 135.6 points to win the meet and Jadyn Barga was the All-Around champion with her score of 36.9. 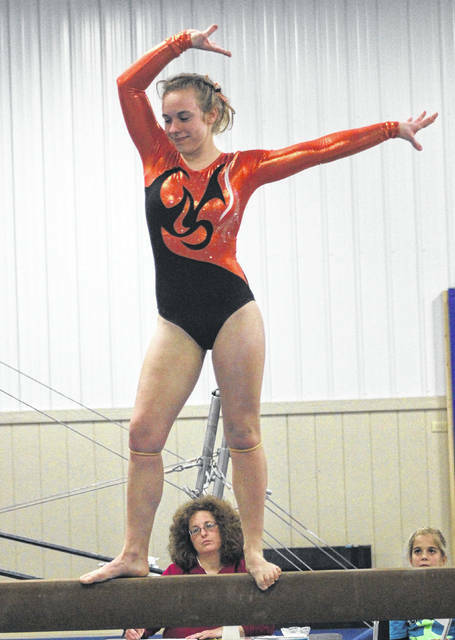 VERSAILLES – The Versailles gymnastics team won its home quad meet last Thursday. The Lady Tigers scored their highest point total of the season with 135.6 points to capture the title. Troy was the runner-up and Northmont placed third in the team standings. 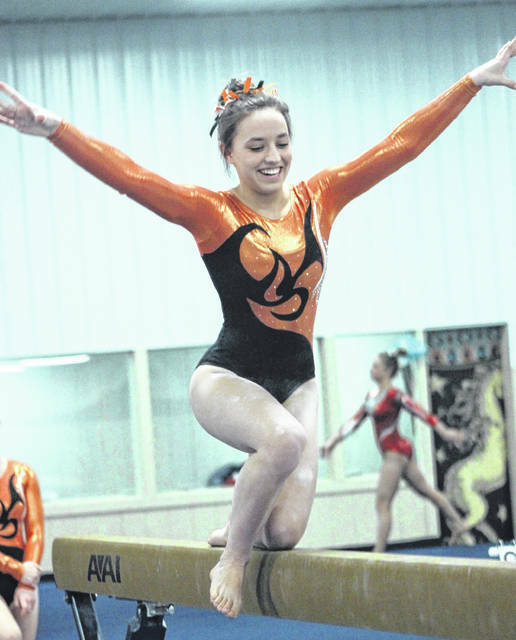 Leading the way individually for Versailles was senior Jadyn Barga, who took first place in the All-Around with a score of 36.9. She also won first place in the Vault, Uneven Bars and Floor while coming in third on Beam. Senior Madison Ahrens also had a good meet placing third All-Around. She placed first on Beam, second on Floor, third on Vault and sixth on Uneven Bars. 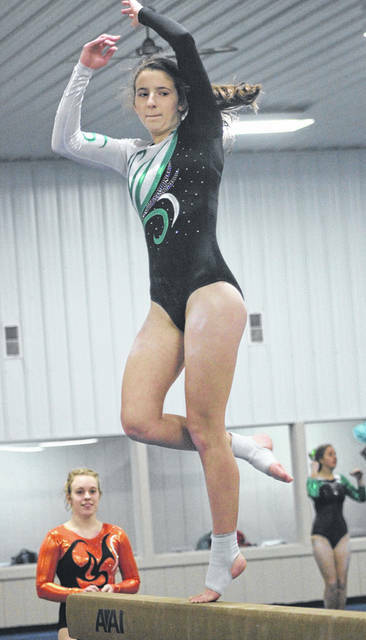 Also contributing was junior Ellie Barga, who placed fifth All-Around. She finished second on Beam, third on Uneven Bars, sixth on Vault and eighth on Floor. Sophomore Jayla Pothast placed ninth on Uneven Bars and Beam and 10th on Vault, Floor and All-Around. “The girls had some nice improvements with Jayla improving by 3.10 over the last meet,” said Versailles coach Jessica Pothast. For Greenville, sophomore Emily Marchal also had a great night. She placed 13th in the All-Around and also had a 2.65 points of improvement over her last meet. Her biggest improvements were on Beam (2.05 points) and Vault (1.20 points). 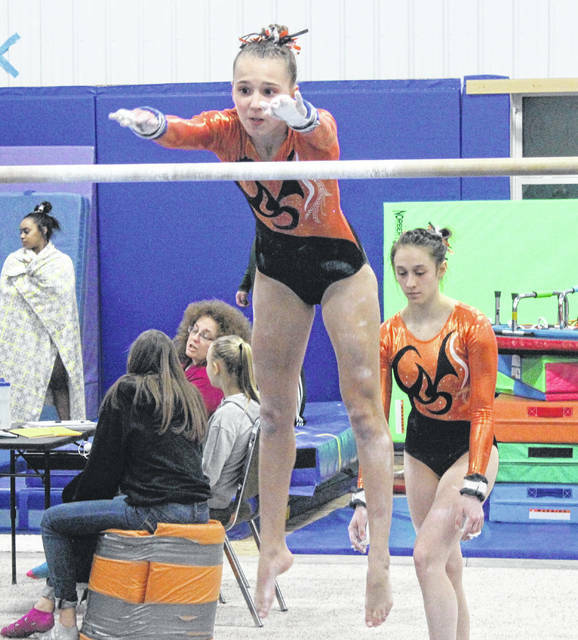 Arcanum was also among the competing teams and there were a total of 23 gymnasts participating in the meet held at the Flying Js Gymnastics located just outside of Versailles. 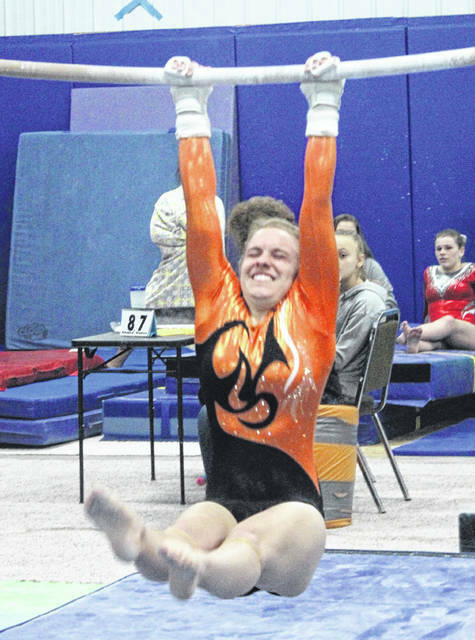 The Greenville and Versailles gymnasts will compete again on Friday, Feb. 8 in the Tipp City Quad at Gem City Gymnastics. Start time is at 5:45 p.m.